(Bloomberg) -- After a crushing defeat in Ukraine’s presidential election, Yulia Tymoshenko buzzed around keeping her aides and supporters topped up with consolation champagne and a promise of glory ahead. That was in 2014. Now, five years later, she’s nursing a third successive loss, knocked out of the first round of voting over the weekend. Rather than another shot at an elusive victory, the runoff on April 21 will be between the incumbent, Petro Poroshenko, and comedian Volodymyr Zelenskiy. 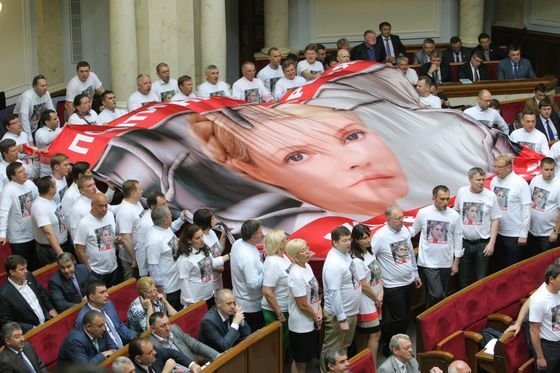 The blond, braided-haired Tymoshenko’s irrepressibility helped her remain the most internationally recognizable Ukrainian politician 15 years after the Orange Revolution turned her into an icon. But the failure to capitalize on a healthy lead in the polls in January reflects the sclerosis in Ukraine, a country trapped in a tug-of-war between east and west, ravaged by an intractable conflict with Russian separatists and strangled by corruption. Born in 1960 in the industrial city of Dnipropetrovsk, Tymoshenko started out in business after marrying the son of a prominent local Communist Party figure. After opening a video-rental company in the late 1980s as the technology arrived in the Soviet Union, the couple began importing fuel from Russia a few years later. Lazarenko, later convicted and imprisoned in the U.S. for money laundering, was soon on his way to becoming prime minister, facilitating Tymoshenko’s transition into politics. It was clear early on she knew how to win support. In late 1996, the economy was in even worse shape, especially in the central Ukrainian constituency where Tymoshenko was trying to win a seat. Power cuts were frequent, even in the late-autumn cold, and pensioners were dying in their homes. She eventually won more than 90 percent of the vote, and began dreaming of far greater things. That same year, Poturaiev spent $600 for a popular television astrologer to predict Ukraine would have its first female president in the coming years, ushering in a time of great prosperity. Ambition propelled her to her high-water mark: the Orange Revolution. It was also her undoing. The years leading up to the revolt against a fraudulent victory for Kremlin-backed Viktor Yanukovych in the 2004 presidential election forged Tymoshenko’s combative political manner. She upset utility companies as deputy prime minister and marched against President Leonid Kuchma over the brutal murder of a journalist, all the while touring Ukraine and swelling her popularity. Her party backed Yanukovych’s rival, Viktor Yushchenko, who had pledged to make her prime minister if he won. 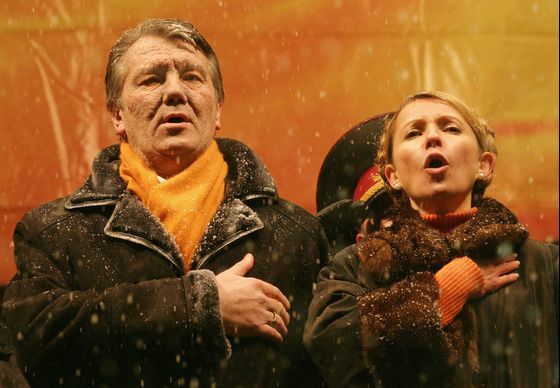 But once Yushchenko honored his promise, making her the first woman to lead a Ukrainian government, things began to sour. Threats to review thousands of past privatizations didn’t go down well with investors. She fought with Yushchenko, who fired her after less than a year. Tim Ash, senior strategist at BlueBay Asset Management LLP, recalls how she walked onto the stage of an investment conference in London shortly after the Orange Revolution and declared herself “the only politician in Ukraine with balls!” “Tymoshenko was the leader that never was,” said Ash. It was a deal two years later that was to prove pivotal for Tymoshenko, and Ukraine. Dispatched to Moscow to resolve a gas dispute that had left parts of Europe freezing, Tymoshenko hammered out a new supply pact with Putin. In 2010, Tymoshenko made it into a runoff with Yanukovych, who was aided by President Donald Trump’s disgraced former campaign manager, Paul Manafort. But her popularity had been drained after the global financial crisis ravaged Ukraine’s economy. Then the gas deal came back to haunt her. Yanukovych, keen to vanquish his nemesis, had her arrested and locked up, saying the accord undermined national interests. She spent two years in prison. 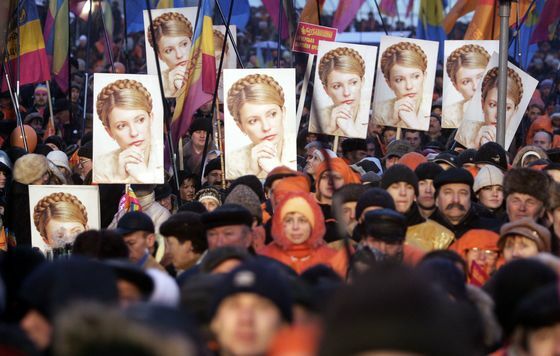 Even from her jail cell, Tymoshenko indirectly triggered the country’s second revolution in a decade. The European Union wouldn’t finalize an association agreement with Ukraine without her being freed, a demand Yanukovych refused to sanction. Under pressure from Putin, he eventually abandoned the EU deal, setting off the chain of events that led to his ouster and Tymoshenko’s release. As she prepared to campaign in 2014, she looked like a spent force. Tymoshenko made what was supposed to be a triumphant return to address Kiev’s Independence Square a day after Yanukovych had fled to Russia. She misread the mood. 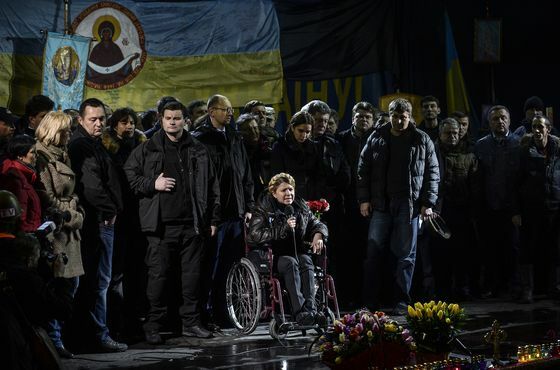 Appearing on stage in a wheelchair and with her braided hair hastily restored, she drew applause for tributes to the protesters who had been killed by snipers. The reception turned as icy as the weather when she talked up her own career. Three months later, she was trounced by Poroshenko. 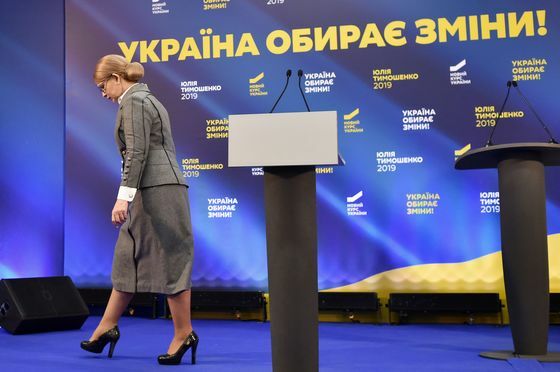 In the 2019 campaign, Tymoshenko railed against the corrupt elite and promised to raise salaries to the level of neighboring Poland, where wages are currently more than four times higher. She pledged also to deepen cooperation with the EU and NATO, policies that irk Russian President Vladimir Putin as he seeks to keep Ukraine within his orbit. She ended up with 13.3 percent of the vote, yet after a rise, fall and rise again, it may be premature to write her off. She may yet take a shot at returning to the prime minister’s job in the fall, when she leads her party into parliamentary elections.